Kellogg's recently introduced versions of their Frosted Flakes and Froot Loops cereals with 1/3 less sugar than their respective original versions. The time seems right as all of America is currently going ape-crazy for a whole new breed of diet fads. From the perspective of breakfast institute - where a chief aim is to find a balance between good taste and good health - the idea seems long overdue. I reviewed the new cereals by comparing them to the originals and comparing the new cereals to one another. Frosted Flakes and, to a slightly lesser degree, Froot Loops could be called breakfast cereal classics - cereals who's flavors are forever familiar to anyone who grew up with them. The new Froot Loops is entirely similar to the original. The reduction in sugar is hardly noticed - most likely because the flavor depends as much on imitation fruit as it does on sugar. The new Frosted Flakes didn't fare as well. Almost to be expected, the cereal that was once called "Sugar Frosted Flakes", has an altered taste when much of the sugar is removed. It's a testament to the original Frosted Flakes that you might be inclined to add a Tablespoon of sugar to make the new cereal taste better. Many good props to Kellogg's for their attempt to make these classic cereals healthier. One hit and one near miss isn't too bad. What do you think of Froot Loops - 1/3 Less Sugar? Is it gone forever? Not in stores and even Amazon anymore! Why we have to feed our kids more sugar??? What stupid manager decided to take my kid's choice away!!! What did they think when they screwed around with the flavor we've been used to for 40 or 50 years. I eat Froot Loops because it reminds me of when I was a kid. This new version reminds me that I am not a kid anymore, but I am be treated as one, a stupid one at that. One who can't decide on my own food choices. My dad taught me to "dress like everybody else, but eat what you want." I WANT MY FROOT LOOPS - NOT THIS CRAP! I dont know what the deal is? This cereal tastes great! I love it, and knowing there is less sugar is a good thing. My husband and I enjoy the entire box in 1 or 2 days. I disagree with everyone. 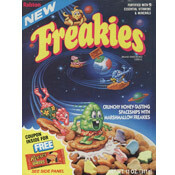 I think the new 1/3 less sugar froot loops lack flavor, and even my husband made an "icky" face when i made him try them. 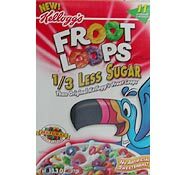 I would rather eat less of the original froot loops and get the flavor i love, than eat the 1/3 less sugar and feel like i am eating air puffs. I tried Fruit Loop 1/3 less sugar last night and I have to comment to someone. I wept! This is NOT a new formula of cereal. It is the long and sadly lost formula of the OLD and GOOD Trix. Why a company would take a cereal as good as Trix and change the formula is not fathomable! This new Fruit Loops cereal must be the work of a VERY smart and creative EX-General Mills employee, and I'm just guessing about my age! Praise the return of the Trix flavor!!! Yes! Finally! A better alternative for our children and even yummy for ourselves! Now can you please explain why I must fork out MORE dough for the new "Less Sugar" cereal? I came away from my local grocery finding that I had just paid 20 cents more for the new Froot Loops which claims to have 33% less sugar in it. Even better: not only does the new cereal have less sugar, it has less cereal (though the box is the same size as it�s sugary predecessor)!